“TTHM” is “total trihalomethanes,” a group of chemical compounds first identified in drinking water in the 1970’s that form during drinking water treatment. The compounds are produced when organic matter in natural water reacts chemically with chlorine disinfectants, and are just one type of a larger family of chemicals known as Disinfection Byproducts. Chlorine disinfectants are added to drinking water to destroy the microbial pathogens that could make consumers sick or even kill them. Before municipal drinking water was routinely disinfected, starting in the US in Jersey City, New Jersey in 1908, waterborne illness and deaths were a common scourge. The rapid, widespread adoption of drinking water chlorination in the early years of the Twentieth Century was a giant step forward for American public health. Disinfection byproducts (also called “DBPs”) like TTHM can be minimized in drinking water by reducing organic matter in water before chlorination. According to the mlive article, “A preliminary report from [environmental consultant] Veolia recommended reducing organics in Flint River water before introducing chlorine, reducing the TTHM formation potential and shortening the time that the disinfectant has to react with the organics.” This important recommendation should not be ignored. Cotruvo continues, “EPA’s regulations on disinfection byproducts were written to use TTHM as an indicator of potential aggregate exposure to all disinfection byproducts. Conveniently, the same treatment processes (e.g., reducing organic matter in contact with chlorine) that control TTHM also control a host of other disinfectant byproducts.” As a current member of the World Health Organization’s (WHO’s) Drinking Water Guidelines Committee, Dr. Cotruvo stresses a significant point made in the WHO’s Guidelines for Drinking-water Quality3: “Disinfection should not be compromised in attempting to control disinfection by-products” (see page 6). In other words, we would not want to return to the days of waterborne cholera and typhoid fever. We don’t have to: We now know how to operate water systems to produce safe water and minimize risks associated with disinfection byproducts. 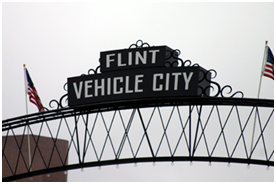 Since April, 2014, the source for the Flint drinking water has been the Flint River. Prior to that, the city purchased treated Lake Huron water from the Detroit Water and Sewerage Department. Sourcing the Flint River is a temporary measure until the city completes a new intake pipe from Lake Huron in 2016. Some in Flint are promoting a return to Detroit water until the intake pipe is in place. Others cite the expense of that option and the fact that TTHM is being reduced in the current supply. Flint is not alone as many communities are struggling with the need to obtain a new source of drinking water. Flint water officials will continue to optimize treatment to minimize TTHM and improve the reliability, safety and wholesomeness of the water. But along with this effort more monitoring is needed, as well as better communication with the public and increased responsiveness when customers complain. A partnership between the water utility and health department is absolutely essential. The State of Michigan’s government from the Governor on down to our health and environmental agencies must also support the local community and demonstrate that they are protecting one of our greatest assets, our water. These efforts will help to restore the trust of consumers. 1 The federal TTHM limit is 80 parts per billion; Flint’s highest TTHM reading was 99 parts per billion, representing an exceedance of about 24%. 2 Federal Register, Wednesday, January 4, 2006, Part II, Environmental Protection Agency, 40 CFR Parts 9, 141, and 142, National Primary Drinking Water Regulations: Stage 2 Disinfectants and Disinfection Byproducts Rule; Final Rule. Online. Available: http://www.gpo.gov/fdsys/pkg/FR-2006-01-04/pdf/06-3.pdf.